A major Internet radio shake up as Pandora missteps on listener hours and Spotify takes the lead on data. NEW YORK (TheStreet) -- When I clicked on Chris Ciaccia of TheStreet's story about Pandora (P listener hours for February, I wasn't expecting anything I wasn't expecting. Another bonehead Pandora PR move that takes us all for a gaggle of fools blinded by the turnip truck's brake lights. Here's the deal: The fact that Pandora's listener hours have slowed -- moderated is probably a better word -- really isn't cause for alarm. Pandora has scale and, as it noted Thursday morning, it is now in prime position to sell this scale to advertisers. But there's a problem or six with how this decision to stop reporting the monthly metrics went down. First, only an idiot would believe Pandora released the numbers publicly and on a monthly basis primarily for advertisers. That's jive talk. They also released them for investors. And you could logically argue that these figures have resonated more loudly with investors over the past two years than they have with advertisers, at least from a public eye standpoint. So now Pandora doesn't want to be quite so public. It prefers the cover of a quarterly conference call that nobody listens to to, I presume, provide some sort of color on listener hours. And there's a transparent reason why -- it doesn't feel as if it can explain away moderating, slowing and, maybe someday, declining growth to the people who move markets. Even though it has a credible explanation, it's just not going to sit well with investors who, particularly with Pandora, tend to ignore and misunderstand the nuance of the business. A business specifically focused on selling time to traditional radio advertising clients. This looks bad and it is bad. Interestingly, I don't think it shows any real holes in the business. Pandora can't possibly keep growing forever. It's never going to be able count every body in the nation as a listener, let alone an active listener. That's unrealistic and, clearly, not even a goal. However, the way Pandora decided to go about the move -- with standard corporate B.S. -- underscores a line I have been reeling lately ... This company has become too corporate. It's no longer dedicated to its mission as much as it is to playing the game of smoke and mirrors it used to stay away from. But, wait, BREAKING NEWS: If I could type faster I would have had an exclusive. 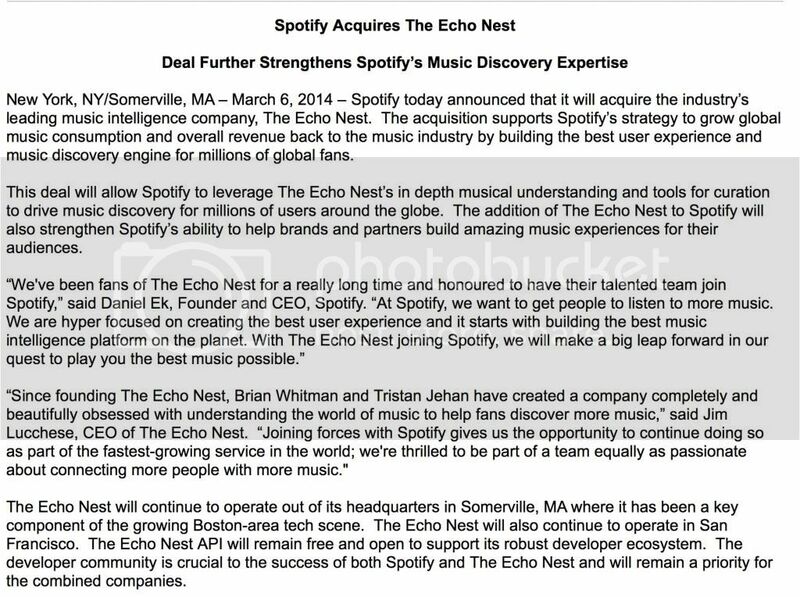 Just before it was announced publicly I learned that Spotify purchased The Echo Nest. This explains why the phone meeting I had scheduled with The Echo Nest CEO Jim Luchese was postponed -- and, as of the moment, not rescheduled -- last week! This is a BIG deal. I copied the press release from my email onto Page Two of this article. I'll have more to say about the acquisition, particularly as it relates to Pandora, next week. But, make no mistake, this is big. It changes the landscape in two major ways: 1) It make Spotify more viable because it provides the company with another revenue stream, one that could grow exponentially over the next few years and, speaking of that revenue stream, 2) It gives Spotify the opportunity to jump ahead of Pandora with respect to using music preference data to help (and make money from) record labels, bands and brands. Pandora just doesn't seem to understand the power inherent in this approach; it's obvious Spotify and The Echo Nest do.